This is exactly how I would describe Levana after reading Fairest. 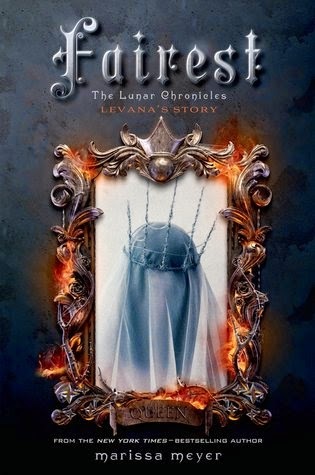 The revelations about the Lunar queen in this book are very surprising and enlightening. It didn’t make me like Levana, but it did make me understand her. I’ve thought of Queen Levana as the wicked, selfish queen, but she’s surprisingly unselfish in her intentions to rule Earth. In a way, I respect her for that, but everything else she did overshadowed that one redeeming quality about her. Still, it’s really good to know her story and what made her what she is in the Lunar Chronicles. I was really surprised to discover that Queen Levana was once an obsessed and a vain (still is) girl. Reading about it, I couldn’t decide if it’s annoying or embarrassing. Being inside her head sometimes made me cringe. Fairest has been a very interesting read. Queen Levana is more than a villain; she is a really twisted villain. Oh, I almost forgot. I had no idea that Lunars are naturally a crazy lot.